Bet Victor Review: Great selection of bonuses to choose from! Bet Victor has closed their poker room. If you're looking to play online poker, we suggest 888 poker, our top global poker room. All links will redirect to 888. Bet Victor is Europe’s biggest and most respected independent gaming companies. VC stands for Victor Chandler, who started out over 80 years ago racing greyhounds and then became a bookmaker or ‘bookie’. Their continued evolution has led them to strive towards gaming completeness by having one of Europe’s biggest poker rooms, which is exactly what BetVictor.com has become. Bet Victor parted ways with iPoker, and is now part of the Entraction Poker Network, which is a small but very solid European poker network. The most notable Entraction member site is Devilfish Poker. The Entraction Network was purchased earlier this year by Las Vegas company, International Game Technology (IGT) for $115 million. As part of their new management strategy, Entraction, and hence Bet Victor, do not accept players from the United States, Canada, Israel, Norway, Russia, or Turkey. By complying with international gaming laws, Entraction aims to be a major player in the USA market when online poker there becomes regulated. Available games at Bet Victor include Limit, Pot-limit, and No-limit Hold’em, Limit and Pot-limit Omaha and Omaha Hi/Lo, 7 Card Stud, and 5 Card Draw, as well as bunch of very uncommon games not found on larger sites such as 32-Draw and 2-7 Triple Draw. NL Stakes range from €.02 – €.04 up to €00 – €400 and Limit stakes run from €0.10 – €0.20 up to €750 – €1500. It does not matter what you play or how you play it; BetVictor has you covered. During peak times, there are several thousand players to be found online, with copious amounts of fish among them. More obscure variations of poker such as Draw and Stud are not as well populated on the network, but you will find some action. However, do not expect as much as the ‘game du jour’, which is No-limit Hold’em. Sit and Go tournaments are pretty popular on the Entraction network, so if this is your favorite form of poker then you may be in luck. Regarding stakes, you will find that every bankroll level is covered. There are tourneys with buy-ins ranging from 55 cents all the way up to €1000 + 30, with the most popular ranging right through the $2 to $20 levels. Multi-table Tournaments (MTTs) are available and you can expect a range of buy-ins from freerolls or VIP Point buy-ins right through to entry fees in the four figures. As far as regular guarantees are concerned, Bet Victor hosts too many to list here, but know that there’s over €100,000 in guaranteed prize pools every day, so you should have no trouble finding a tournament that offers a structure, buy-in and prize pool to your liking. Bet Victor offers its own unique VIP Point System. Called their VIP Programme, different tiers are available based on how often you play. As you move up in the tiers, benefits increase, including cash back rewards and tournament entries. Bet Victor has always taken on the software package of the network which it currently belongs to, so if you’ve played there in the past and left because of the software, it’s definitely worth checking them out again. Bet Victor’s switch from iPoker software to Entraction software, while fundamentally the same, does offer a new look and color palette for players looking for something fresh. Aside from some slight rearrangements in the lobby that greet you when you open it, Bet Victor should be pretty familiar if you’ve ever played at an online poker room before. 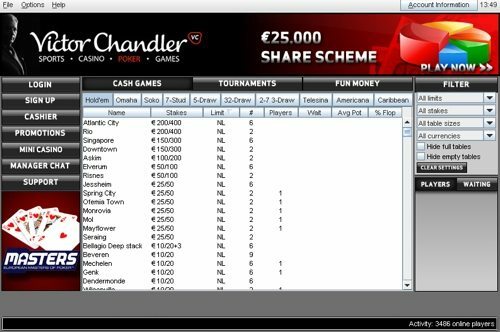 Along the top of the window are a series of tabs so that you can choose the type of poker you want to play, and then on the far right are some more advanced filters so you can list only tables of a certain limit, stakes, currency or based on other distinctions. You can of course easily access both the cashier and support from within the poker download. The table layout is fairly simple, but perfectly functional. Animations are smooth and it’s a very simple avatar-free design that should run at a solid speed even on slightly older computers. Stack sizes and bet sizes are fairly clear, as is the size of the pot. The only slightly negative thing we have to say about the table interface is that the buttons are fairly cluttered when it’s your turn to act- in addition to the standard three buttons, there are five buttons below the bet slider for betting various fractions of the pot, from a min-bet through to shoving all-in. While these buttons can often be quite useful, most other poker rooms find a way to make them take a bit less space, so you’re not faced with an overwhelming array of miss-click opportunities when multi-tabling. Online poker has been popular for so many years now that pretty much all poker rooms have their interfaces reasonably under control and are reasonably similar. If you’ve played poker on the internet before, whether on an Entraction site or elsewhere, you should have little trouble coming to grips with the Bet Victor client. Overall, the Bet Victor client is efficient, and easy to use. Bet Victor has seen a drop in action since moving from iPoker, the fourth largest network in the world, to the Entraction Network. However, the action Bet Victor does see is nice and fishy. At peak hours, there are about half the players online as there once was, so at odd hours cash tables may take a few minutes to fill up, but its certainly worth the wait. Bet Victor is also home to some of the softest tournaments on the internet. Check out their guaranteed tournaments as they are always filled with plenty of fish. Bet Victor Sit and Gos are also soft and if you place on the SNG Leaderboard you can make some extra cash. While the poker landscape has changed in the past few years, Bet Victor continues to go strong. Fish won’t be handing you money, but if you are a solid player, you can easily exploit your opponents. Plenty of fishy action can be found by registering in a tournament at Bet Victor. Assuming you win all the hands you should, you can rack up a lot of money in their MTTs. Bet Victor offers a a 200% up to $1,000 bonus to all new depositors, meaning your deposit bonus will be twice as much as you deposit! Deposit $500 to take full advantage of the $1,000. There’s no bonus code to enter; simply sign up using our links. You have 30 days to earn the bonus which is released at a rate of $1 for every 8 Action Points earned. The Bet Victor Poker bonus releases in 10 equal installments. If you get the full $1,000 bonus amount, then it will pay out in 10 installments of $100 each, and you’ll have to accumulate 800 points to unlock each portion. VIP Points are earned by playing real money ring and tournament games at a rate of 2 for every dollar raked or paid in fees. As a new player, you’ll be eligible to participate in the €500 New Player Freerolls and the €500 Guaranteed New Player Turbo tourneys. These tournaments will be available to you for your first six weeks at Bet Victor. Besides a great first deposit bonus, players can boost their bankrolls thanks to Bet Victor’s VIP Cash Back. The more points you earn, the larger fraction of them you can convert to cash. Any left over Action Points can be used to buy into tournaments, but the rate offered for doing so is quite poor. At the highest VIP Level, Diamond, returns of around 30% are possible. Click here to join Bet Victor! 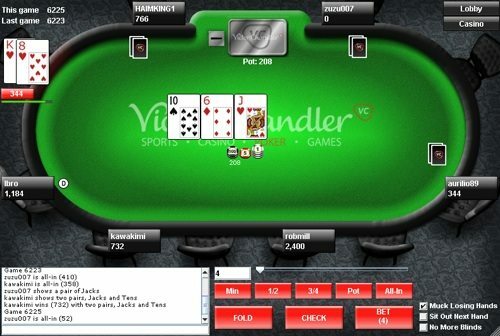 Victor Chandler Poker has live chat with operators who are always available, helpful and courteous. If you have a problem, the quickest way to resolve it is via live chat. Alternatively, you can contact them through e-mail, the address is listed below. Money can be deposited instantly at Bet Victor using Credit/Debit cards and cashed back out the same way. Neteller, Paypal and other payment processors are also an option. First cashout wait periods have been reported to exceed 3 days.